There was a little smokes shop or candy store two or three doors down from the barber where I’d be sent to get my hair cut (”Tell him you want it styled”, my father would say to me, handing me a few bills to pay for everything.) that carried a tiny selection of comics. I’m pretty sure that they were only DC books, and then only a small number–mostly just Batman books, though a few Superman ones I have were purchased there as well. I don’t know if the owner just liked Batman or what, maybe he was trying to stack the deck in terms of sales by focusing on only the most popular and well-known characters. Either way, after one such haircut I was able to drop thirty cents on this issue of DETECTIVE COMICS. 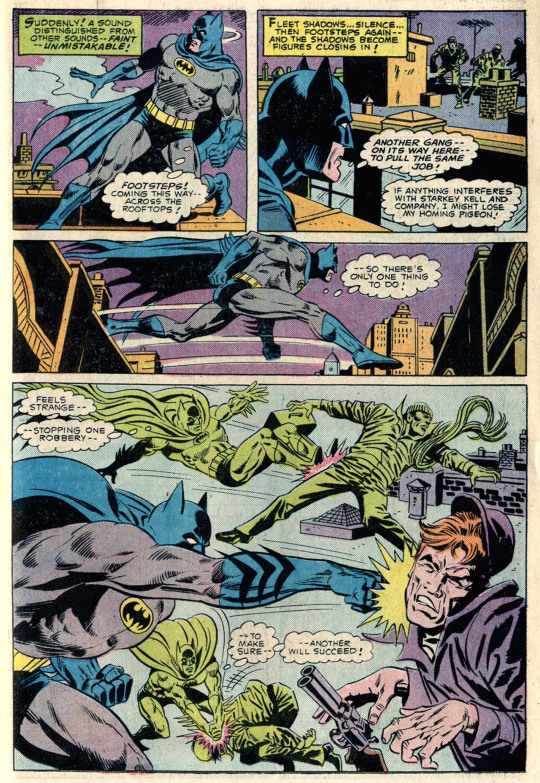 The lead story is one that focuses on the relationship between Batman and Commissioner Gordon, as well as the lingering question of how Batman keeps his true identity a secret. 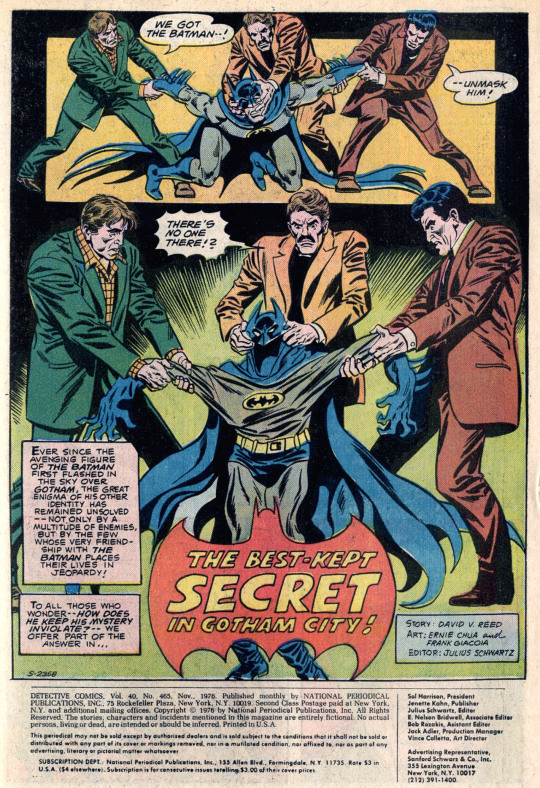 It opens several years in the past, with Batman telling Gordon that it’s inconceivable that criminals won’t think that Gordon knows Batman’s true identity. 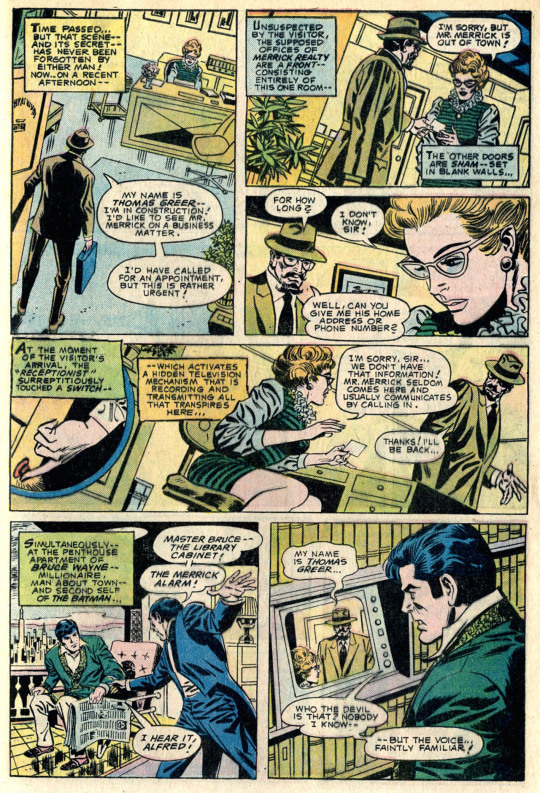 So, if he’s ever in a situation where he’s being pressed for that information, Batman tells him to disclose the fake name of Neil Merrick, a real estate businessman, and that he will take things from there. And so it is that when a man walks into the offices of Neil Merrick, a sham office front kept up by Bruce Wayne all these years for this very purpose (and who knows what the receptionist makes of her job, sitting in an empty office day after day without any contact from anyone else) Batman is alerted to the fact that Gordon has been abducted. Through detective work, we see him use the image of the disguised man from the camera footage to discern his true identity as Starkey Kell, and then how he activates a web of informants, like those used by the Shadow, to get a handle on Kell’s current whereabouts. 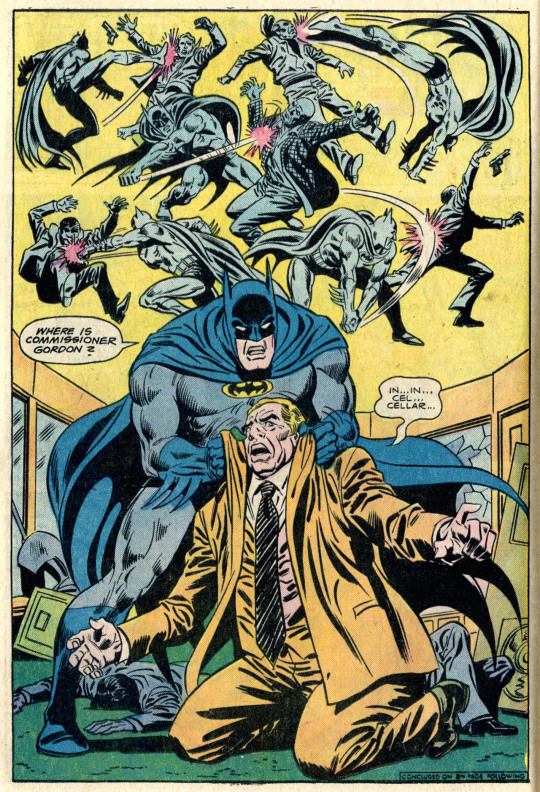 Batman’s network of informants comes up with a location and time for a job that Kell will be pulling, and Batman is there waiting for him, intending to follow him back to the Commissioner. A complication arises in that an entirely different gang of crooks turns up, intending to rip off the same place, and Batman lays into them, needing to prevent their robbery so that Kell’s will succeed and he can follow the heister back to his captive. Succeeding, Batman trails Kell and his crew back to their lair, where he beats the absolute hell out of them. They’ve got Gordon locked up in the cellar, still alive and unharmed, fortunately. Batman and Gordon agree to keep the details of this caper hushed up, to prevent copycats from attempting the same thing in the future. And as Batman vanishes into the night, Gordon ponders on the question of his benefactor’s true identity and what he would say if Gordon told him his own guess as to the Batman’s true identity. 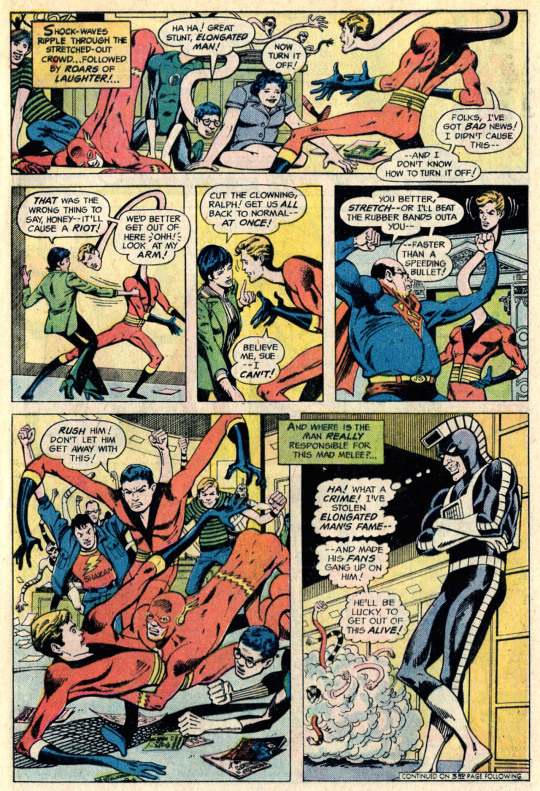 The Elongated Man backup was the continuation of a serial running through the back pages of DETECTIVE COMICS during this time. It concerned a new criminal, the Calculator, who was battling one super hero after another in sequence. Unbeknownst to the heroes in question, as they defeated them, the Calculator was striking the special key on his uniform, rendering him immune from them in the future. In this way, he hoped to make himself invincible, through losing–a novel approach! Having previously fought Hawkman and the Black Canary, it was now Ralph Dibny’s turn. 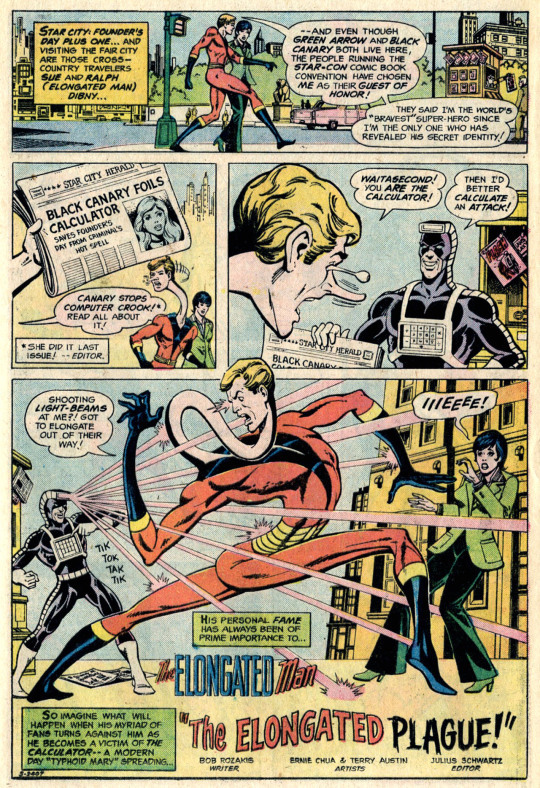 The action takes place at a comic book convention, where the Calculator uses his powers to cause all of the attendees to develop an elongating plague–and who all blame the Elongated Man for their difficulties. Young artist Marshall Rogers fills the story with caricatures of DC staff members. (NOTE: Kurt Busiek correctly points out that this chapter was drawn by Ernie Chua/Chan, rather than Marshall. Oops!) Eventually, by turning his gimmick against his opponent, Ralph stretches the Calculator to the point where he relents, reverses the process, and everybody is back to normal. But before he goes off to jail, he’s able to immunize himself against the Elongated Man, so it’s mission accomplished! Next month’s target: Green Arrow!